100 Unforgettable Dresses is filled with the stories, secrets, intrigue, and insights behind the most indelible dresses in our collective memories. Featuring looks from the runway, film, television, the red carpet, and the worlds of royalty and politics, this book celebrates the staying power of these gorgeous, sleek, sultry, and outrageous creations as well as the lasting impact they've had in fashion, popular culture, and our own lives. More than two hundred images, a witty, informative text, and exclusive interviews with the designers and the women who wore the dresses reveal the initial spark and captivating drama behind the making of each dress. Also featured throughout are extensive anecdotes and observations about great style makers—Grace Kelly, Audrey Hepburn, Cher, Sarah Jessica Parker, Jacqueline Kennedy Onassis, and Cate Blanchett—highlighting the conception of their most spectacular looks and examining their lasting influence. Here is the tale of how a canny Gianni Versace helped an unknown Elizabeth Hurley become world famous overnight, thanks to the paparazzi frenzy whipped up by her red-carpet appearance in his now legendary safety-pin dress. Learn about the unique wedding gown Narciso Rodriguez designed exclusively for Caroline Bessette-Kennedy that inspired a whole new generation of brides. Go on the set of Top Hat, where Ginger Rogers's ostrich-feather-laden dress began to molt immediately upon arrival, its flying feathers bringing the film's production to a halt. Of course, the seminal work of exemplary designers—Yves Saint Laurent's Mondrian dress and Christian Lacroix's pouf, Chanel's little black dress and Valentino's infamous red ones, Diane von Furstenberg's iconic wrap and Marc Jacobs's grunge collection—is featured throughout, with plenty of inside information on what inspired the invention of each piece. 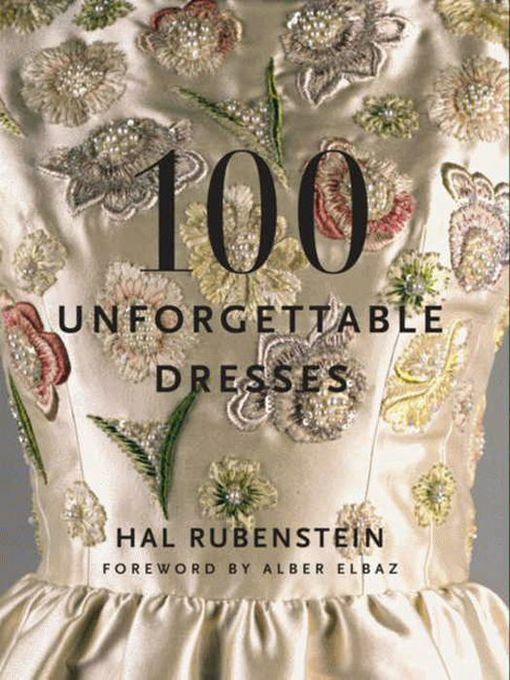 With its wonderful anecdotes, fascinating facts, and just enough juicy gossip, 100 Unforgettable Dresses is a bewitching read for everyone who enjoys sensational clothes, movies, television, and music. Whether you're a fashion maven, a red-carpet addict, a celebrity tracker, or a pop-culture aficionado, you won't be able to put this book down!